Years ago I designed a beautiful afghan for The Needlework Shop using this stitch. The afghan was worked with a white background and a solid green colored yarn for the waves. Using an ombre colored yarn for this dishcloth makes the end result so much prettier. Could you imagine using all of the different ombres on the market and how gorgeous that would be? This is an intermediate skill. It’s a little tricky carrying the colors from one row to the next. It is well worth the effort. 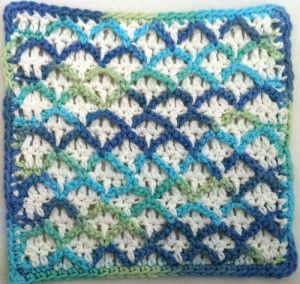 Enjoy the Ocean Waves Crochet Dishcloth and other patterns in the Seaside Dishcloth Set. I think this one is my fav so far. 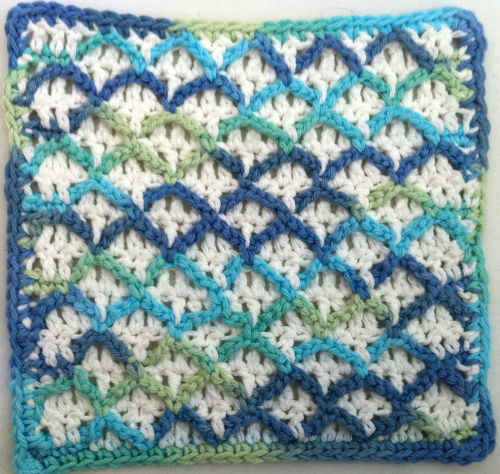 The texture created by the ocean waves lends itself perfectly to the function of a dishcloth. Very practical ..and attractive too. Thanks for sharing the pattern. I know I’ll be making this one. This one IS lovely. I agree with artgal: the texture is perfect and the colors are beautiful. 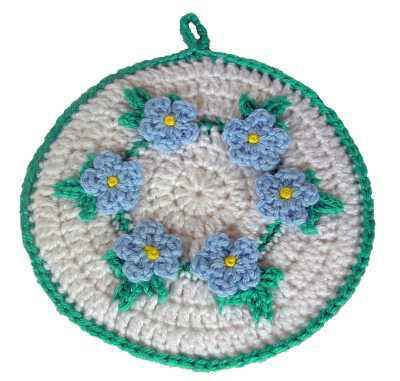 So glad I discovered your wonderful crochet dishcloth. I have been trying to do somethng along with the same lines as the lattice Patter. I guess I ran out of steam. I wondered if you would mind if I linked to your website on Ravelry and I would also post your original picture. I just love Ravelry and search for most of my knit and and crochet patterns. Please let me know if you are OK with the link and picture on Ravelry. I did do an intensive search for your name and projects.. Thanks so much – either way. Your pattern is exactly what I was looking for. Thanks for sharing. Could anyone tell me what “htr” stands for in row 2? Thanks so much! Very excited to make this pattern!